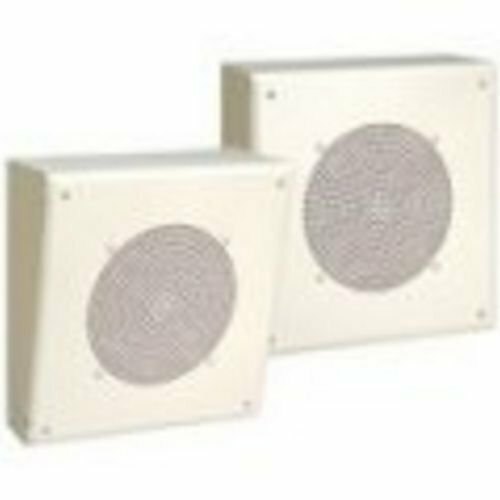 Bogen's MB8TSL speaker feature an all-steel surface-mounted enclosure with an 8" cone loudspeaker and multi-tap 4-watt 70V/25V transformer. The MB8TSL speaker is designed primarily for wall mounting, with front face angled downward by 12.5 degrees. Manufacturer: Bogen Communications International, Inc. Manufacturer Part Number: MB8TSL. Brand Name: Bogen. Product Model: MB8TSL. Product Name: MB8TSL Speaker. Product Type: Speaker. [Technical Information] RMS Output Power: 4 W. Minimum Frequency Response: 110 Hz. Maximum Frequency Response: 15 kHz. Sensitivity: 96 dB. [Physical Characteristics] Material: Steel. Form Factor: Wall Mountable. Weight (Approximate): 9.00 lb. [Miscellaneous] Package Contents: MB8TSL Speaker Toggle Bolts Wood Screws Wire Crimps. [Warranty] Limited Warranty: 2 Year.